Carrier bags issuing a warning to adults purchasing alcohol for under-18s have been distributed by police. Off-licences throughout the Forth Valley area have been given the bags in a bid to tackle the issue. They contain information about penalties that can be imposed on anybody convicted of the offence. The plans also aim to raise awareness of the risks to young people - when consuming alcohol. Posters have also been given to stores in the area. Supt Gary Lawrie, Operations, from the Forth Valley division of Police Scotland, said the move had been successfully trailed in other parts of the UK. He added: "Anyone who buys alcohol for somebody under 18 is acting in a completely reckless and irresponsible manner and they are putting a young person at risk." As part of the push this month police will also be aiming to catch those who buy alcohol for anyone under age. 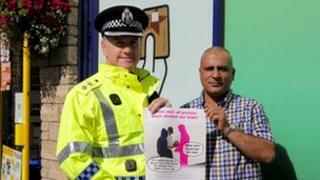 The imitative has been developed alongside the Alcohol and Drugs Partnership and Crimestoppers. Forth Valley Alcohol and Drug Partnership provided funding for the bags. Their co-ordinator, Elaine Lawlor, said: "There is a very good reason why it states 18 on the label of alcohol bottles, the same amount of alcohol will have a much greater effect on the body of a child or young person than on an adult because their bodies are still growing and developing. "Young people do not have the experience needed to deal with the effects of alcohol on judgement and perception." Kate Jackson, national manager for Crimestoppers Scotland, said: "Local people are often aware who is responsible for making these purchases which they pass on to young people. "You can do the right thing by telling us and by doing so, possibly prevent episodes of anti-social behaviour or danger to young people in your community."